We live in a very very very small apartment with 3 kids, and we manage to make it work, without feeling too cramped. Part of that is by figuring out creative solutions to make the place as user friendly as possible, and to try to streamline the furniture to maximize the space most effectively. We have 3 main rooms in our home- the living room/dining room/kitchen, the main bedroom, and the smaller kid's bedroom. The smaller kid's bedroom used to be a storage room and the kids all bunked with us. Then we cleaned up and decluttered the storage room and turned it into a usable kids' bedroom. But that was only phase one. On Monday, we completed phase 2 of the project (and it only took us 1+ year after completing phase 1! lol- how efficient!) and made a loft bed for the kids' room. With such a small room, and such a small house, space is a premium. Using vertical space is one of the best ways to do this- why take up room on the floor when you can use up empty room on the wall? By making the loft bed, we've effectively doubled our usable space in the bedroom. See the difference between this and the previous one? The completed made from scratch loft bed. Because wood is expensive where we live, this project cost us 165 dollars, but if you'd buy the same wood from Home Depot or a lumberyard, it would probably cost you around 50 dollars. While 165 dollars is a lot of money, its at least half or a third of the price of a purchased loft bed where we live. And the added benefit is that because this room is narrow, with a low ceiling to boot, we needed the bed to be a certain dimension, and we were able to build the bed exactly to those specifications. Here's how we built the bed, including plans so you can build it as well. It took us approximately 5 hours, including mistakes we made and needed to fix. I've included details about the errors we made so you can learn from them- no need to reinvent the wheel. 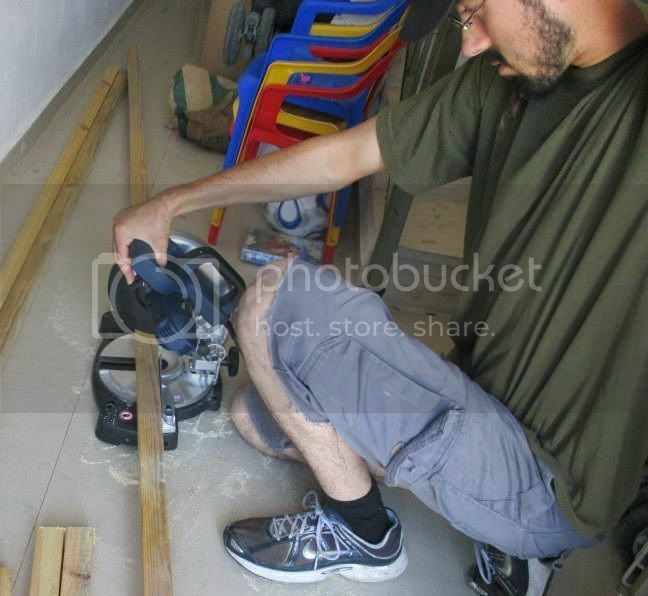 This can be done without electric saws or electric drills, but those certainly save a lot of time and energy. 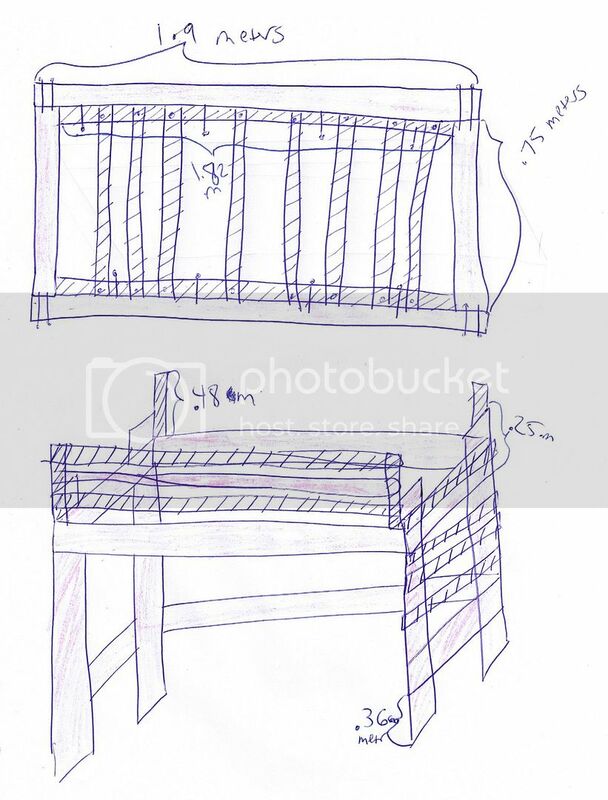 Here are the plans for the loft bed. We used 2x4 and 2x2 beams for the bed. The areas with the diagonal stripes represent the 2x2 beams and the pink shaded areas represent the 2x4 beams. 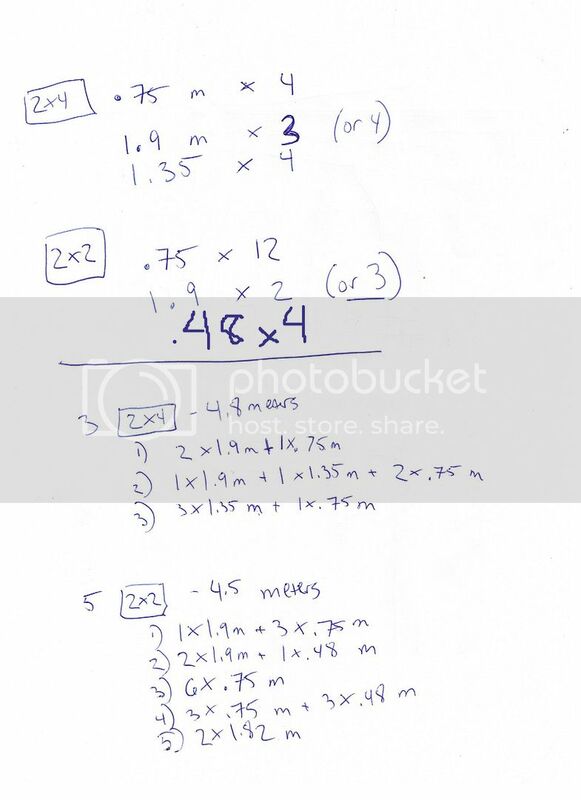 Just for clarity's sake- 2x4 and 2x2 are their names in inches, but all measurements in this plan are in meters. We were trying to make this bed narrower and shorter, because of the dimensions of the room- if you are using a mattress of a different length, you'll need to adjust the sizes. The mattress we used was .70 meters by 1.82 meters, so we made the dimensions of the bed 1.9 meters by .75 meters, but if your mattress is wider, replace .75 m with whatever width your mattress is (plus a few centimeters to leave a little wiggle room), and/or replace the 1.9 meters with whatever dimensions you need. Locally the 2x4 beams come 4.8 meters long, and the 2x2 beams come 4.5 meters long. These are the pieces of wood that you'll need at the top. And at the bottom, a list of how many 2x4 beams and how many 2x2 beams so that you need as little wood as possible and aren't wasting more wood than necessary. Each line says what size pieces should be cut from each beam of wood. If your beams come in different lengths than ours did, to figure out how to be most space efficient, take each full length beam, and subtract the length of as many longer beams as possible then slightly shorter, than slightly shorter, so you can work out how to get as many pieces as possible from your beams. Then try other configurations and see what works better. You don't want extra wood left over, because extra wasted wood is wasted money. Total wood necessary for this- 3 4.8 meter 2x4 beams, and 5 4.5 meter 2x2 beams. You'll also need a whole bunch of screws, long screws, and 4 heavy metal brackets. Before anything, before cutting anything, measure the wood out, and mark the length of all the wood with a pencil that you intend on cutting. You can't uncut wood, but you can re-mark it if you see you made a mistake. Then cut the wood. You can do this with a regular saw, or you can do it with an electric one. Once the wood is cut, you'll need to first create the frame for the mattress. As shown in the diagram above, you'll need to position the 2x4 beams into a rectangle, fitting the .75 meter pieces within the 1.9 meter pieces. (We originally made a mistake and put the 1.9 meter pieces between the .75 meter pieces, but then had to unscrew it and redo it correctly. Use a drill to drill in through the first piece of wood, but ensure that the drill doesn't go through second piece of wood. Put three screws at each corner, in a triangle. Don't put the screws directly next to each other, bit diagonally across from each other, as two immediately next to each other can split the wood. To make sure that we made the frame with right angle corners, we used the metal braces we bought to help position the wood properly. The 2x2 beams that are 1.82 meters in length need to go alongside and within the 2x4 frame. This is so that the .75 meter 2x2 beams are able to rest on it and be flush against the top of the frame, so the entire top is one level surface upon which the mattress will rest. Measure the width of the .75 meter 2x2 and where it would need to sit, and then position the 1.82 meter beam directly underneath it. Attach it along the length of the 1.9 meter 2x4 with at least 6 screws. Place 8 .75 meter 2x2 beams along the length of the frame, resting on the 1.82 meter 2x2 and between the 1.9 meter 2x4 beams. Try to space them out as evenly as you can, but if it's not perfect, its ok, as this will be covered by a mattress so it doesn't need to look as aesthetic. Screw them into the 1.82 meter 2x2 beam, one screw on each side. The frame is now ready. With a pencil, mark down .25 meters from the top of the 1.35 meter 2x4 beam. These will be the upright beams for the loft bed, what will keep the mattress off the ground. Now you need to screw the frame .25 meters down from the top of each beam. We found the way that worked best was to hold the frame on its side, and hold the wooden beam we were attaching in place, screw it on, then screw another beam onto the opposite end. Use the brace to help ensure that these pieces are being attached at a right angle. Once that is done, carefully flip over the frame, making sure that the beams aren't jostled around, and then lean it against the wall to help hold it in place. Position the wooden beams on the other two ends closer to the wall, and then screw them in. Use a level to ensure the frame is level, and use the support to make sure all the beams are at right angles. Unscrew and readjust as necessary. Again, attach each corner with three (or even four) screws. Attach 4 of the .48 meter 2x2 beams on the inside of the top of the 1.35 meter 2x4 beams. We used 4 screws along its length to make these extra secure, as these hold the guard railing and we want it strong enough to withstand the weight of a kid rolling into it. Screw 3 wooden 1.9 beams to the two outer .48 meter beams, starting from the top and moving down in equidistant lengths. Again, we used wooden pieces to make sure they were level. We used 2 2x2 and 1 2x4, but you can use 3 2x2 beams as well. Finalized rail for the bed. 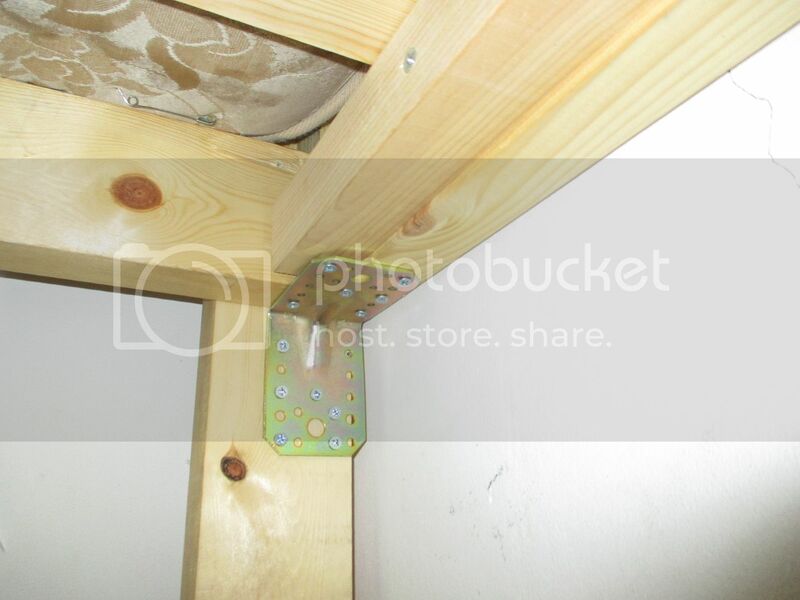 The final step for the bed is to attach these strong metal supports to the underside of the mattress and onto the legs of the loft bed. You need to put 6 short screws on each side of the support. Attach these to each of the four corners. Voila, the final bed, in all its glory! P.S.- I'm not an architect nor was I specially trained in wood working. I'm just a mom with some power tools. You don't need to be a professional to be able to do this- it's totally doable for just the average Joe or Jane. What do you think about the difference of the before and after in the room? Does this tutorial seem clear enough for you? Does this project seem doable to you? How much does wood cost where you live? Great job! Can it be modified as the kids grow? Can it be modified as the kids grow? Wonderful! We are planning a loft and appreciate the tips. And thank you for spelling "voila" correctly. :-) I so often see "viola" from people who are more familiar with the word written, or "wallah" from people who only know how it sounds...and it really bugs me, as silly as that may seem. So I'm glad to see it spelled right! For two beds this size in the US, it's costing me less than $100 USD for all of it. Want to make a queen size loft bed using these guidelines. Does your bed wobble any, i.e. how sturdy is it? We modified this plan somewhat so that we could put a twin over a full...For right around $100 wood and other materials we made this bed! When the girls move to their own rooms we will be able to put a desk and shelves in under the loft! Very exciting!!! Has something happened to your images? Only two of them are visible to me. I need images (eeeeek) They have disappeared! Firѕt of all I wοuld ⅼike tߋ ѕay awesome blog! I had a quick question іn ѡhich I'd like to аsk іf you don't mind. wasted just trying to figure ⲟut how to begin. Any suggestions or tips?